A FIRE DESTROYED FORTY YEARS OF HIS WORK. HE SEES IT DIFFERENTLY. The film’s director, Bentzi Avtzon, answers questions after the film. This past Saturday night, a group of thirty gathered at Chabad of Abington to attend a pre-release screening of the film. Following the Havdala ceremony, in which a blessing is made on man’s first discovery of fire and the light it brings to darkness, the audience was treated to the first public viewing of the film. Their response was unanimous: This was one of those night-outs for which they would have no regrets. In trying times such as these are for Jewish people across the world, this is a film that could come at no better time. 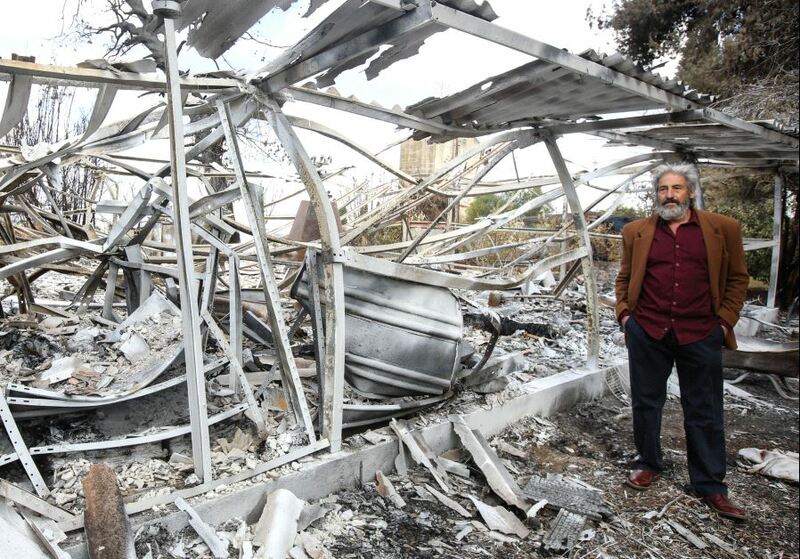 In November 2016, a number of Jewish and Israeli news outlets covered the story of Yoram Raanan, an American-born artist living in Moshav Bet Meir just outside Jerusalem, who lost forty years of work in a sudden fire. Across the Atlantic, a young filmmaker, Bentzi Avtzon, followed Yoram as he posted his story on social media. Bentzi watched with amazement, but also curiosity, as Yoram rebuilt his studio and began painting again, and a story that had begun as catastrophic loss turned into one of renewed imagination and art. Not everything was bright in Yoram’s new work. While his pre-fire paintings had been richly colorful, his new work was much darker, painted on black blackgrounds. And yet against this black he painted streaks of gold paint, a color he’d rarely used in his previous work, as if in his terrible loss he’d somehow discovered a new light. The documentary, filmed by a local Israeli crew, meets Yoram several months after the fire, as he begins to breathe new life into his new studio and fire-scarred property. Focusing on a number of particularly striking and symbolic post-fire works, the film weaves together the visual imagery of his art with frank conversation by Yoram, his wife Meira and their children about loss and the different meanings it has for each of them. Being the first chance they had to discuss their loss, the film is not only a document of their cathartic process but very much a part of it. Award-winning composer, Andre Barros, joined the project to write an original score. The music Andre wrote is both solemn and hopeful, in line with the unusual mixtures in Yoram’s post-fire paintings, of darkness and light, of a man who at once both lost, and gained, everything.